"Tell me, won't ya tell me, won't ya tell me, won't you tell me..."
While I have been working diligently on finishing the first safety video and planning out the next installments, I wanted to shift the focus to another interesting project I have been working on – the Tools Wiki. 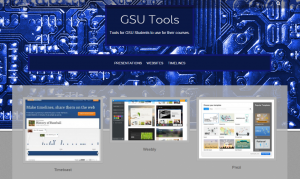 The Tools Wiki is the brain child of Valerie and will be a clearing house of online resources with GSU examples for students to use and expand. For example, for assignments that require students to build website, they could use the Tools Wiki to find what other students have used in the past and see examples of their works. As always, I am open to any and all feedback, so if you check it out, tell me know what you like/dislike/expected/etc. Below is a “new to me” band, the Mother Hips from California with their song “Third Floor Story”, I found it to be a great jam song with a catchy chorus and of course a couple of Ooo OoOoo’s thrown in for good measure.